The iPhone X is the most hotly anticipated smartphone of the year, but you might have to wait until next year to actually get your hands on one. That’s according to several analysts speaking to USA Today. The most optimistic of them is Gene Munster, a tech investor and analyst with Loup Ventures, but even he reckons the iPhone X won’t be in stock until January at the earliest. Tim Bajarin of Creative Strategies said it will be “a good three-four months until the X is in wide supply,” and Jan Dawson, an analyst with Jackdaw Research, claims you’ll be able to find the iPhone X in stores “sometime in the first quarter” – a period which runs until the end of March. While these are just guesses – albeit educated ones – there are plenty of reasons to think the iPhone X might be in very, very short supply. For one thing, we’ve heard numerous reports about production problems and delays, thanks primarily to the new OLED screen and Face ID scanner, and this is clearly a product that’s taking Apple more work than usual, given that it’s not even officially landing until November 3. 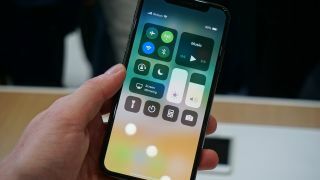 When the iPhone X does arrive, not only might it be in smaller numbers than usual, thanks to these problems, but also it’s likely to be in higher demand. Despite the high price tag it’s clear that the bulk of the interest seems to be on the iPhone X rather than the iPhone 8 or iPhone 8 Plus, and it’s no wonder, given how much of an upgrade the X is, at least on paper. In fact, analysts expect the iPhone X to sell out within an hour or two of pre-orders opening on October 27, followed by long lines in stores and Apple playing catch-up over the following few months. So, while no-one knows for sure how the iPhone X launch will play out, or how many handsets Apple will have managed to build, it seems that if you want one you should get your order in the second it’s possible to, otherwise you might be waiting a long time.